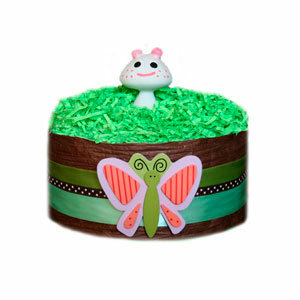 This Organic Pound Diaper Cake is vibrant and attractive, decorated with a wooden butterfly, radiantly colorful ribbon and topped off with Vulli's Chan Pie Gnon 100% natural rubber teething toy. We take special care to ensure ALL of the diapers are usable by the new mommy. This is a GrowInStyle Exclusive Design. © 2009. All rights reserved.